At the weekend I went on a Dawn Quiet Walk, with Aunehead Arts and Tony Whitehead. 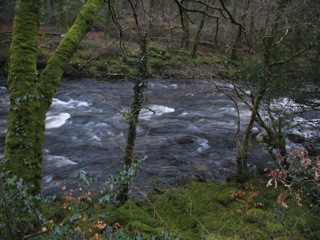 Starting at 5.30am, we walked a short distance along the River Dart, near New Bridge. Light quickly came. Darkness fading, greyness growing, fading to colour, many shades of grey, blue and green. The multi-layered sounds of river, birdsong, planes, constant river water. Short gatherings for talking. Longer opportunities to sit and listen. It’s during these sittings, as I focus on sound, thoughts also rush in, flooding out sound and shifting my presence away. Returning to listen, so many layers to tune into, that fade in & out, I’m struck by the huge amount of sensory input my system is potentially aware of. So much to perceive. My senses and nervous system filter out what my body & sense organs receive, enabling focus, but potentially missing whole realms of experience. I remember children I work with, those at early stages of development, and particularly those others with developmental delay & sensory disability. These children often wallow in their fascination with a particular sensory experience – the visual stimulation of a spinning dustbin lid – the tactile experience of pressing the front of the body over a smooth table top – the vestibular (balance sense) experience of hanging upside down off a chair …. As I sit on a mossy rock, by the Dartmoor river, I’m connected too to my sensory experience. As I listen I hear the white noise of the river separate … into gurgles & plops … hisses & tinkles … noises near and dispersed. am I lost …. or am I exploring?